Friday, March 26, 2010: Since it’s been a while since we had a “down day” we decided today was the day. 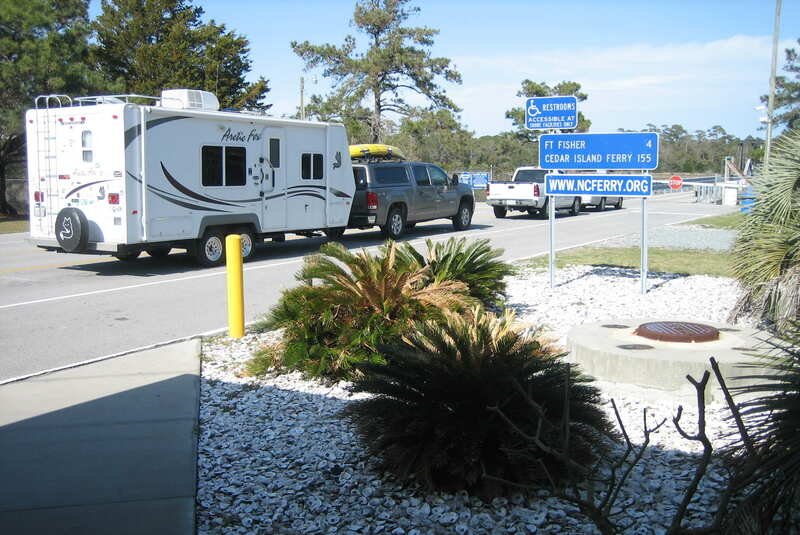 We are still at Short Stay Navy Recreation Facility outside in Monks Corner which is just north of Charleston, South Carolina. We spent the day walking the grounds, relaxing around camp, visiting with fellow campers, doing laundry, taking care of truck and trailer maintenance and otherwise just goofing off. 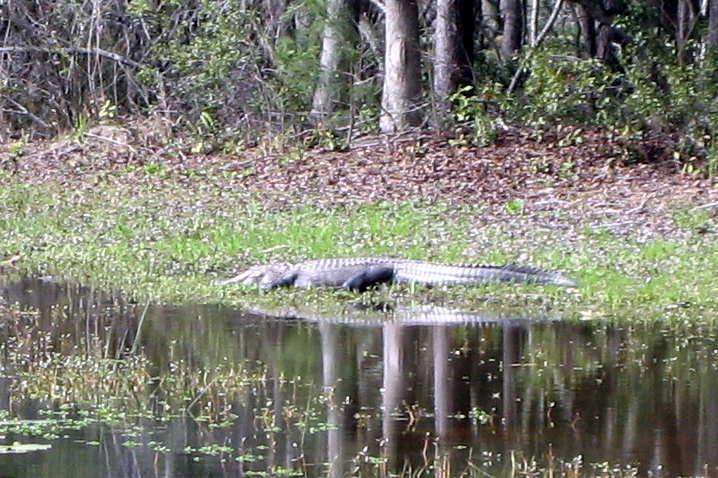 On one of our walks around the campground we spotted this fellow sunning himself on the banks of a pond. Didn’t see many little “RV Dogs” scampering about however. Folks kept them on a pretty short leash so they don’t end up as “Gator Snacks”. We had the opportunity to meet our campground neighbors. Al and Gail are a very pleasant couple from Pembroke, Massachusetts. They travel the east coast quite a bit in their large 5th wheel trailer and are venturing to Alaska soon. We really enjoyed meeting, swapping Navy stories and getting to know them. They lived in Maine a number of years ago when Al was assigned to VP-8 at Brunswick Naval Air Station. Al retired from the Navy about the same time I did and now he and Gail own a Fire and Security Alarm company in Pembroke. They plan to visit Maine this summer in their RV so we invited them to give us a call when they travel through and hopefully we can arrange a visit. We also met Ray and Susan, a nice couple from Columbia, South Carolina. They were camping at Short Stay as well just a few sites up the road from us. Ray retired form the Air Force and they travel in their 5th wheel trailer a great deal spending many months on the road. 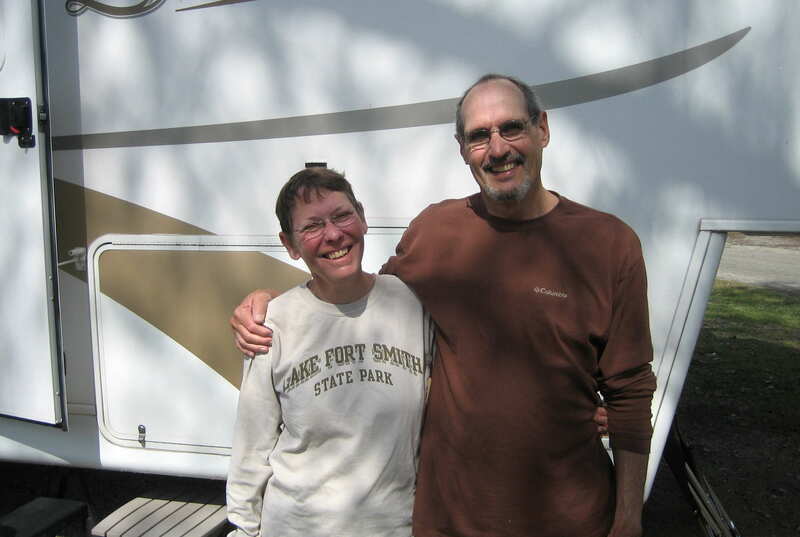 Ray and Susan have visited over 30 National Parks and Historical Sites over the past few years. We enjoyed talking with them and picked up some travel pointers on locations we should explore. As it turns out they are planning a RV trip through Maine and into the Maritime Provinces of Canada this summer. We invited them to call us as well on their travel up the coast. 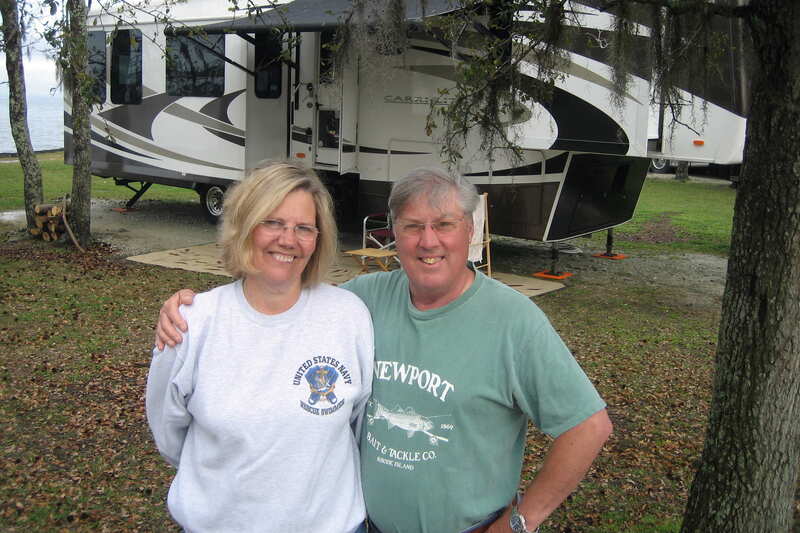 One of the true pleasures in RV traveling is that everyone we meet is friendly and interesting to talk with. Kit and I enjoyed meeting and visiting with both couples and sharing our individual life stories. We exchanged contact information and would really enjoy seeing them all again. 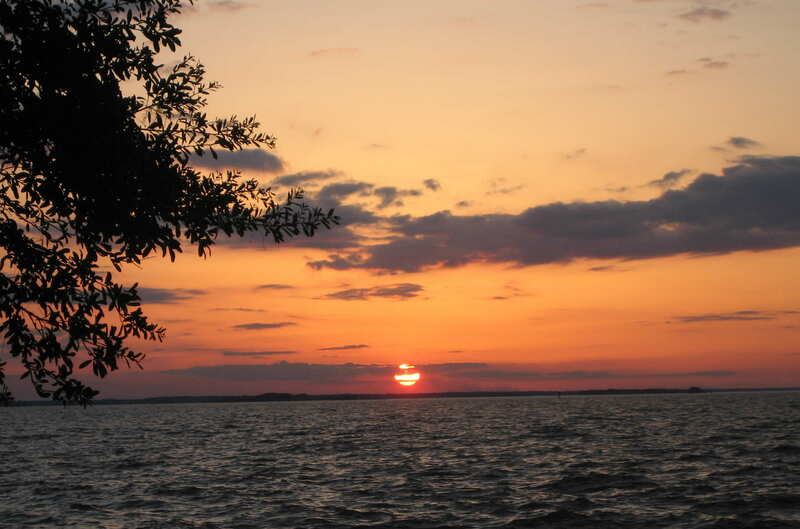 That evening we relaxed and enjoyed another picture postcard sunset across Lake Moultrie. 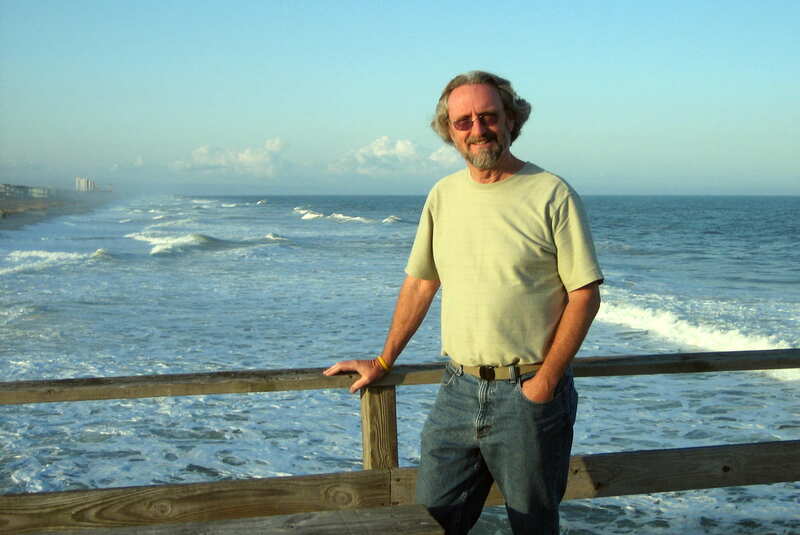 Saturday, March, 27, 2010: Decided to play tourist today. We drove into North Charleston to try and find the places we lived back in 1966 while stationed here with the Navy. We didn’t find our first place, which was no surprise as it was really old and kinda run down, but we did discover that it had been replaced with an equally old and run down house. Our second place was an ancient mobile home which was set up in the side yard of the first house. I didn’t take any pictures as the area has deteriorated into “not too nice” and frankly we didn’t want to stop and walk around. I’ll let Kit talk about this place as I was gone to sea a great deal of the time. Kit’s Corner: This was where we lived after Bill finished Sonar School in Key West. We arrived in early Sept. of 1966, Kimber was just a year old and we were expecting Joe. It was also my first test of being a “Navy wife” as the ship left (taking Bill) about a month after we arrived in Charleston. Fortunately, with good neighbors, I figured out quickly how to manage things on my own. For obvious reasons, we never did much sight seeing in the area but the areas I frequented, such as the base hospital for regular doctor appointments, the commissary and the exchange were very nice; I really grew to love the area. We had four distinct seasons and each was special was very different from living in hometown of San Diego. Once Joe was born, in May of 1967 and Bill came home for a few weeks here and there, we did manage a few outings. Even though the area has grown quite a bit, it was nice to get back and explore. Our third place in the three years we lived in Charleston was in a nice trailer park west of the Ashley River. We set up our newly purchased 12’ x 60’ mobile home…..a virtual mansion to us. The trailer we owned was long gone but the park basically looked the same and was obviously well managed and maintained. The Charleston Naval Base shut down in the 1980’s and has slowly been redeveloped into a marine terminal and civilian shipyard. Driving down Reynolds Avenue, which led to the main gate, many of the old buildings that housed the sailor bars, tattoo parlors and locker clubs are still standing, but now vacant. Touring the former base was kinda eerie as I recognized many buildings, piers, shops and other structures. The former Naval Station was mostly dilapidated now although signs of budding renewal were evident. One area that has been redeveloped contained a new building which houses the recovered Confederate submarine Hunley. The CSS Hunley, a 40 foot, hand cranked, submersible was built in 1836. At only 44 inches in diameter the crew had to spend hours sitting on a wooden bench, hunched over the hand cranks for a max speed of 4 knots. If that wasn’t bad enough the only light in this dark tube was a lone candle. When the candle went out the crew had to surface, which was no small feat itself, for more oxygen. And today’s sailors complain about conditions at sea……they actually have it pretty good. The CSS Hunley demonstrated both the advantages and dangers of submarine warfare. A successful attack the evening of February 17, 1864 on the USS Housatonic in Charleston Harbor proved the value of undersea warfare. However the CSS Hunley never returned to shore and all eight crewmembers perished; the reason why is still a mystery. 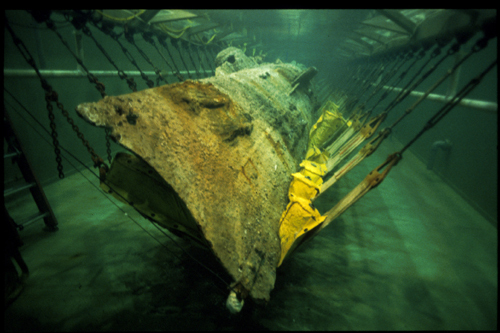 In August 2000 the Hunley was recovered basically intact with the remains of the eight crew members still at their stations. After extensive forensic investigation the Confederate sailors were buried with full military honors. Since the research staff would not allow any photos of the historic vessel I pulled the following off the web. However, the sight of an actual 145 year old submarine, so well preserved, was simply incredible. 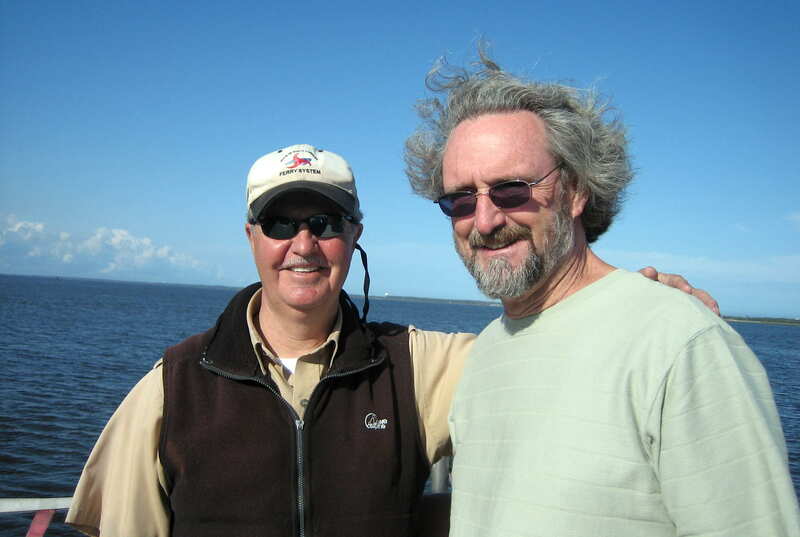 After a very interesting time at the Hunley Scientific site we headed toward Folly Beach, a favorite destination for Kit and I back in 1966. The place was a lot more crowded and now has that generic touristy beach town look. We just drove through and left. 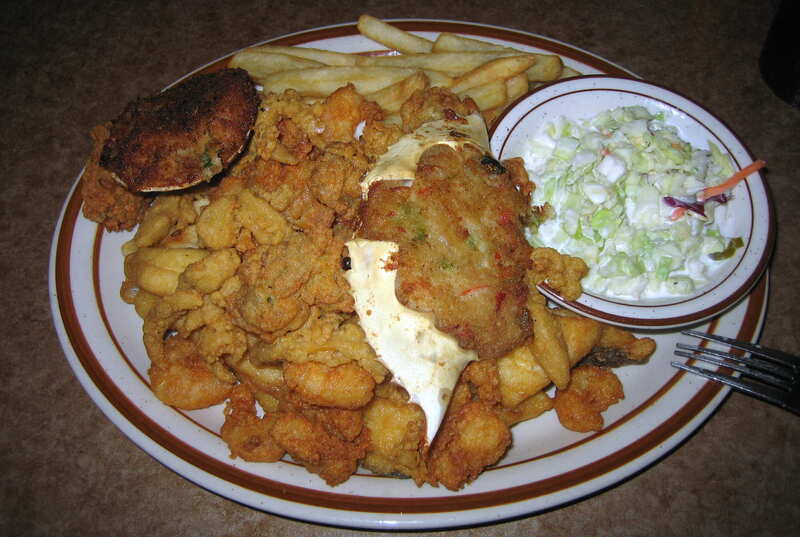 On the way back into town we did stop for an incredible meal at the Charleston Crab House located on Wappoo Creek which is a tributary of the Ashley River. Arriving back at the campsite we settled in for the evening and discussed the day over cocktails. Sunday, March 28, 2010: Taking up the invitation from Dan & Janet, the couple we met a few days ago in Savanna, Georgia we visited them at their place in North Charleston. They live in a very nice home on the edge of an upscale development which affords them nice wooded views from their rear sunroom. 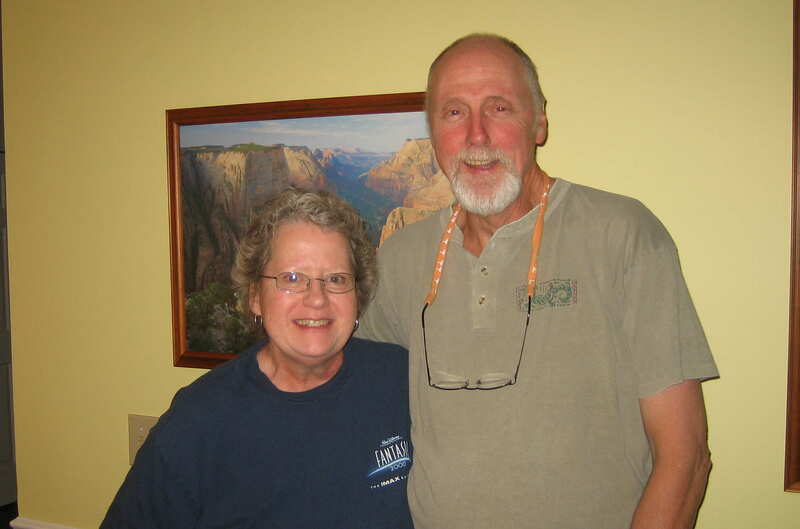 Retired educators, Dan and Janet are an interesting and accomplished couple with many adventures to their credit while traveling extensively during their summer breaks. We enjoyed a great home cooked meal and thoroughly enjoyed swapping stories about each others lives and families. We invited them to Maine this summer for a visit and truly hope they take us up on the offer. Monday, March 29, 2010: Left Charleston under cloudy skies and temperatures in the 70’s. We took US-52 to US 17A and headed north. Entering the small town of Andrews, South Carolina there was a sign proudly proclaiming “The Home of Chubby Checker”. 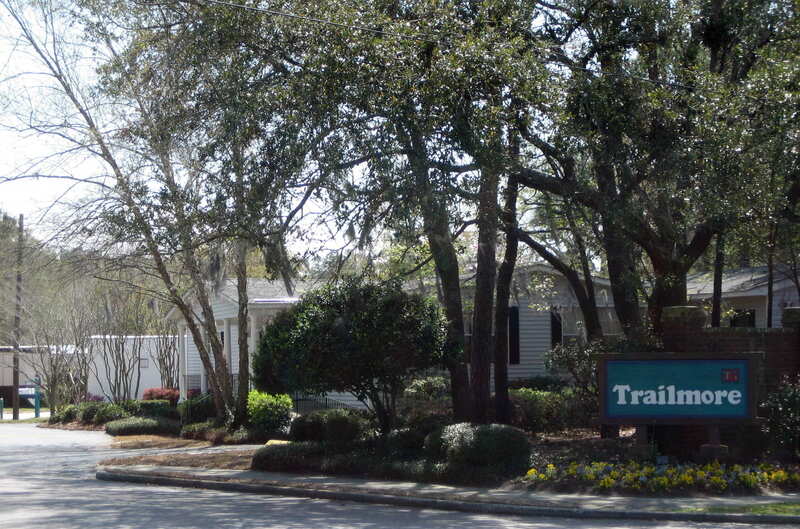 Further down the road, in the town of Conway, South Carolina we saw a sign for the Tidewater Cricket Ranch. Now that I gotta see…..however all 2000 head of cricket was kept in a muck bucket so it weren’t much. We entered the town of Southport pulling up to the ferry terminal and waited for the next boat. 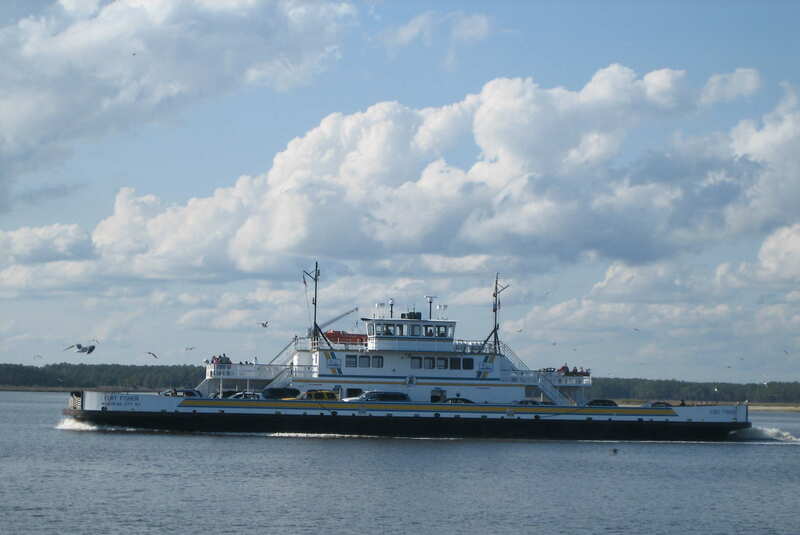 The North Carolina Ferry System consists of 24 boats servicing 7 routes. The boats have a draft of only 4 feet so they can operate in the shallow waters of the sounds and rivers that separate the mainland from the outer banks. The ferries transport over a million vehicles a year and some folks use them to commute daily. In addition, local school children ride the ferries as children in other areas would ride a bus. Now I don’t normally believe in fairies, but seeing these ferry boats I realized that they must have their own navy. So…..it just might be a bit dangerous to not believe in fairytales. Once on the boat our Maine plates were spotted by one of the crew. Chuck is a retired police officer from Maryland and spent a great deal of time in Maine sailing out of Camden. He spent the entire transit telling us fascinating information about the area. I was particularly intrigued by the island where “Weekend at Bernie’s” was filmed. This film classic is a favorite of mine. I even spotted the navigation buoy that played so prominently in the waterskiing scene. Another item checked off the old Bucket List! Pulling into Fort Fisher we traveled north to Kure Beach (pronounced keerie beech) and stopped at a restaurant Chuck recommended for yet another fantastic seafood dinner. Are you seeing a theme running through these journals? Mexican in the southwest, barbeque in Texas and seafood all along the eastern seaboard. Yep…..we are eating our way across the US. We should call this trip “The Bill and Kit Excellent Gluttony Tour”. 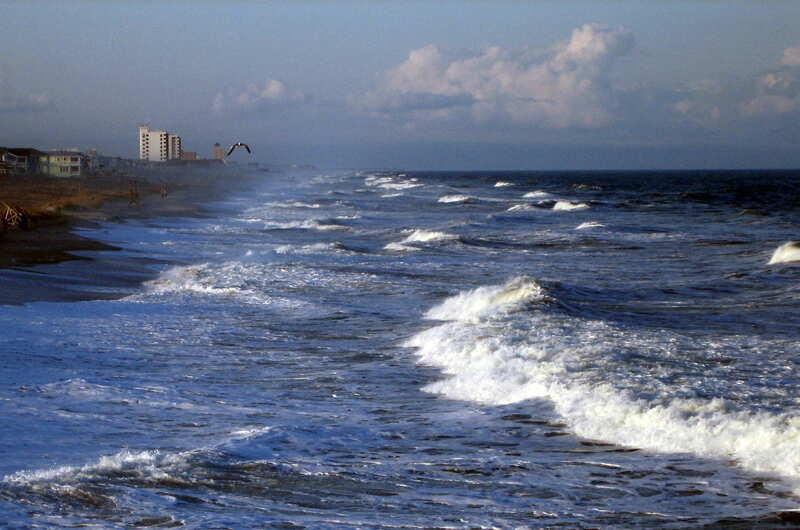 The town of Kure Beach is a resort area with the Atlantic on one side and the Cape Fear River on the other. It is a quirky place with many very colorful cottages and shops. After our meal we decided we needed to walk around a bit. 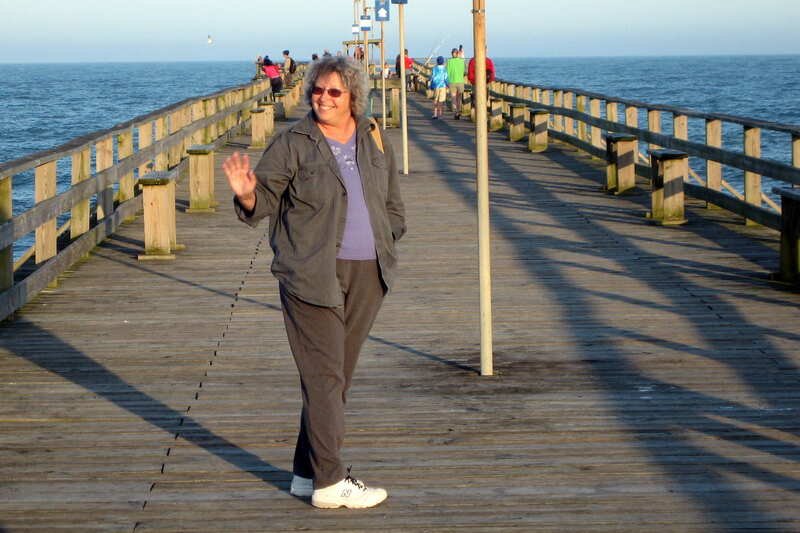 We ending up at the community pier to enjoy the setting sun and to watch the fisher folk and surfers do their thing. Tomorrow we head to the Newport, North Carolina for a long anticipated reunion with some old Navy friends.